Born Ermes Effron Borgnino in Hamden, Connecticut, Borgnine's careerwith appearances in over one hundred feature films and three television series began with his acting debut on Broadway playing a male nurse in Harvey. His film career took off in 1953 when he was cast in the role of Sgt. "Fatso" Judson in From Here to Eternity (1953). Generally cast as a villain, he played against type in 1955 as Marty Piletti, a shy and sensitive butcher, in Marty (1955), winning an Academy Award for Best Actor. Between 1962 and 1966 he played Lt. Commander Quinton McHale in the popular TV series McHale's Navy. In 1984 he returned to television as Dominic Santini in the action series Airwolf, and in 1995 he was cast in the comedy "The Single Guy (1995) as doorman, Manny Cordoba. When not acting, he actively supported numerous charities and spoke tirelessly at benefits throughout the country. From 1970. he periodically performed as the "Grand Clown" for The Great Circus Parade in Milwaukee, Wisconsin. 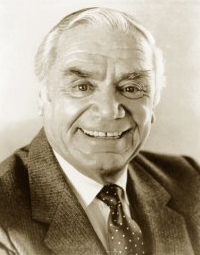 An active freemason, Borgnine was also the honorary chairman of a programme to support the Scottish Rite Childhood Language Center in Richmond. Source : California Freemason ; Abingdon Lodge No. 48 website accessed 2007/04/12.